What are the 10 reasons why breakfast is important? I think many will not be able to answer this question. 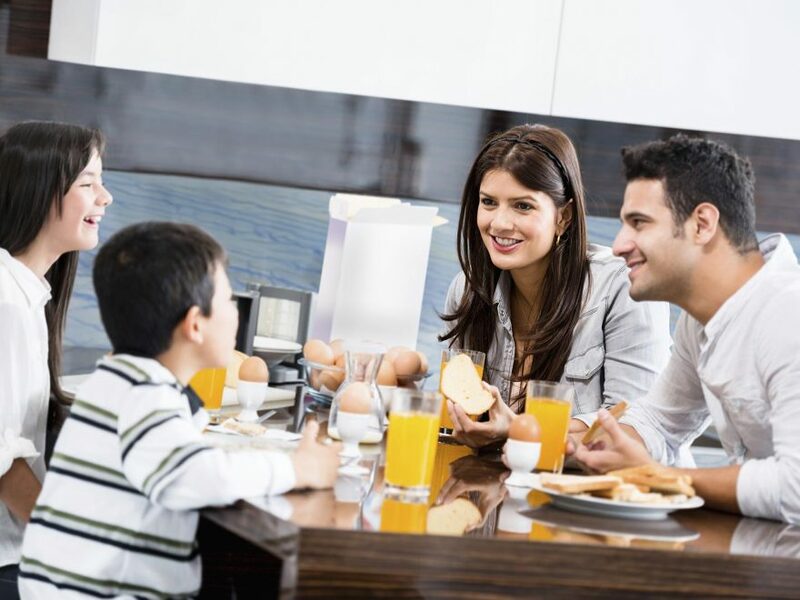 in this article, we will provide you with 10 reasons why breakfast is important. Pay attention! The breakfast has to be done upon waking, or after washing in the morning, if we need to take time to clear our heads and we feel like eating something. Regarding calories, we must take into account that they have to assume between 20 and 25% of the total energy of the day (thus we will not feel faint midmorning.) Mainly, it should be formed by three food groups: dairy (skimmed or whole, depending on our needs), farinaceous (bread, cereals, muesli … better whole, since they retain all their nutrients and fiber) and fruits, which provide vitamins and natural fiber. Are you one of those who throw themselves into the street with only a coffee or without taking anything? Well, you must know that you yourself are putting the first obstacle of the barrier race in which the day will be converted: you will lack vitality and everything will be difficult for you. The breakfast is considered the most important meal of the day because it is the first to do after a period of prolonged fasting all night, and it is with this meal with which we return to readjust our metabolism(all the physical and chemical processes of the body that convert or use energy). Fasting decreases energy expenditure (burning fewer calories), and it is the first intake that helps us start doing it. Therefore, not skipping breakfast helps maintain normal body weight. WHAT HAPPENS IF WE DO NOT HAVE BREAKFAST? The organism adapts to the situations to which we submit it. If we do not usually have breakfast, we do not break the nighttime fast and, then, we do not activate our metabolism. That is, the body will decrease its energy expenditure. Repercussions? It will affect the development of our daily activities, both physical and intellectual, and will cause us to arrive at the next meal with more hunger, with which we will tend to eat more, and this may favor fattening. breakfast provides the energy needed to tear body and mind after a night of fasting and rest. It also improves memory, concentration, and productivity, according to research published in the Journal of Adolescent Health. Breakfast is the fuel for the body! if you skip breakfast to eat fewer calories a day and lose weight you know you’re causing the opposite effect: get fat. Why? When the body is hungry because you have skipped an active meal alert mode and begins to save energy and calories because you think we may be missing in the future, which burns fewer calories and do not lose weight. Sitting at the table and breakfast correctly means, on the one hand, that you have risen with time to eat and start the day without hurry and relaxed, on the other hand, dedicate this moment for you helps you start the day without stress and with time to prepare mentally for the day. Breakfast is a perfect time to live with the family. Between all the members they can help to elaborate on the foods that are going away to consume and to select the most healthy options and of this form to avoid the overweight and the obesity. Start the day with an excellent habit such as breakfast, will remain throughout life and develop other good eating habits to raise awareness about the importance of feeding properly. The main source of energy is glucose (sugar) from food. When the brain receives a constant flow of sugar, we stay alert, improve our ability to learn and retain information as well as concentration. It also makes us happier by improves our mood and reducing stress levels. People who eat breakfast are less likely to suffer from chronic diseases such as heart disease and type II diabetes. With breakfast, blood sugar levels stabilize preventing low glucose. Also, if breakfast is omitted, the food intake will be higher later (and we will usually choose not very healthy options) due to the prolonged fasting that causes us to be hungry. Having breakfast every day we will have control of the portions that we consume throughout the day and we will take care of our weight. Breakfast decreases the risk of having a heart attack. According to research conducted by the School of Public Health of Harvard University, people who do not eat breakfast are 27% more likely to suffer a heart attack because skipping this meal, leads to suffering diseases such as obesity, high cholesterol, and diabetes. Eating breakfast in the morning helps form healthy eating habits. These are formed mainly in the early stages of life. This is where parents should pay more attention to the eating behaviors that their children are forming. The learning at that stage is very much based on imitation, so it is essential that, first, parents improve their eating habits by giving more importance to the first meal of the day. Provides the necessary nutrients to make the body work properly. Each of the five meals that we make per day has the function of providing the hydrates, proteins, and fats that the body needs. – Dairy products. They present high-quality proteins, calcium, vitamins A and D and vitamins of group B (especially B2 or riboflavin). – Complex or slow carbohydrates: cereals, bread, wholegrain muesli … They provide energy that the body is taking gradually, depending on their requirements. These hydrates satiate, have fiber and repress the desire to take fast hydrates (industrial pastries, chocolates). – Fruit. It has water, vitamins, minerals, and fiber. It is better to take it to the natural, with its skin than in juice (it sats more and conserves all its fiber). – Proteins, which give energy and help the formation and renewal of tissues and cells. Choose low-fat deli (chicken or turkey). Healthy fats, such as margarine. Look for them with Omega 3 and 6, since they help to take care of the heart and maintain cholesterol levels. Yogurt + muesli type whole grains + apple in pieces (160-230 calories). A glass of milk + whole toast with margarine or ham or Serrano + orange (180-260 calories).